I always think of pasta carbonara as breakfast pasta. Bacon, eggs - sounds like breakfast to me. It's not traditionally made with gnocchi, but I hadn't had any of these guys in so long that I had to see what the switch up would taste like and it is definitely something that I will try again. While making homemade gnocchi is not to difficult and certainly fun as you roll the gnocchi up and down the traditional gnocchi boards, I have to admit that these are not homemade. Add that board to the Sur La Table wish list and soon we'll have a post on homemade gnocchi. In the meantime, this recipe calls for a package of store-bought gnocchi. Put the water on to boil and cut the bacon into a small dice. Cook the bacon in a small saute pan. Whisk the egg yolks, parmesan and half and half together in a small bowl. When the bacon is nice and crisp, remove to a towel-lined plate to drain. Cook gnocchi. When the gnocchi is finished (about 3 - 4 minutes), drain and return to the pot. Pour the egg mixture over the hot pasta and stir quickly as the heat from the pasta will begin cooking the eggs. Continue to stir while you add the drained bacon. Split the pasta between two bowls, sprinkle a little parmesan over each serving and enjoy! wow, you're really rocking the breakfast menus. How do you have th energy to lay it all out in the morning? 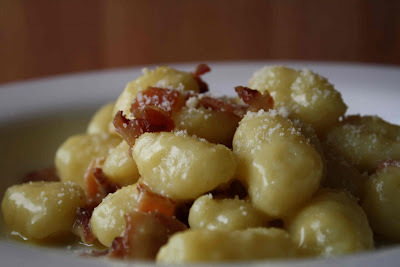 I wouldn't have thought of gnocchi for breakfast but I'm thinking of it now! It's so hard to find gnocchi in the stores here and I've tried to make it a few times, but I haven't got it nailed yet. You have inspired me to try again. Hi Rachel and Katherine - I actually had this for lunch! Didn't mean to confuse. I think of it as having breakfast for lunch or breakfast for dinner. Though you both have given me a great idea - gnocchi for breakfast! Yum. (2) who needs a gnocchi board? roll 'em off a fork. Hi Michelle - true, true, but I'm a kitchen gadget junkie. So if I convince myself I need a certain tool to complete a task, then I have the perfect excuse to go out and buy it! That just sounds too delicious!! Love gnocchi! Gnocchi for breakfast! I love it! I will have to try this for my husband! This is quite the breakfast. Another great way to start the day! I don't know if I could eat it at brealfast, but what an awesome lunch that would make. It looks really delicious!